We offer domain registration service both with and without hosting packages at competitive prices. It comes with complete control over your specific domain. In fact, no restrictions on the domain names are imposed from the registrar's side. We also offer free DNS service with all our domains where you can edit MX records, CName records etc. Click here to check your domain and book it. Click here to check our hosting plans. 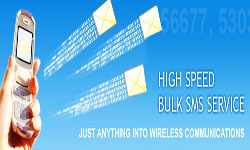 SMS Solutions has a very user-friendly interface that will get you started in no time. Register, sign-in and begin as easy as that! Here's an overview of all you can do with SMS Solutions. Our SMS Excel plugin can be directly integrated with Microsoft Excel and one can send different SMS to different mobile number at once instantly. Click here for demo account for Bulk SMS. Complete teacher information is available at teacher-info. It is useful site teachers and students of Andhra Pradesh. Here you can find a lot of infomation on education. Keep watching teacher-info for regular updates. Click here to visit teacher-info.